Who doesn’t like chocolate? It’s so many things: a sweet childhood treat; a decadent adult indulgence; and lately, it’s even been heralded as a kind of health food. And why not? A 2011 Swedish study found that women who ate more than 45 grams of chocolate a week had a 20 percent lower risk of stroke than women who treated themselves to fewer than 9 grams of the sweet stuff – this is probably because cocoa has anti-clotting, blood-thinning properties that work in a similar way to aspirin In fact, regular chocolate eaters bring a host of benefits for to hearts too, including lower blood pressure, lower “bad” LDL cholesterol and a lower risk of heart disease. One of the reasons dark chocolate is especially heart-healthy is its inflammation-fighting properties, which reduce cardiovascular risk. But yep – for these health benefits to kick in, only dark chocolate will do, and given the fact that cocoa beans are usually heavily sprayed with pesticide, organic dark chocolate is by far the healthiest choice. 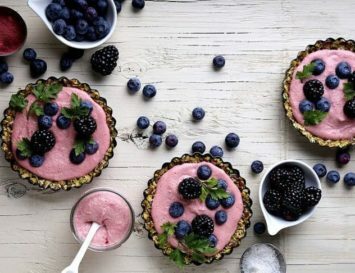 For many, switching from the typical (but unhealthy) milky, sugary choccies to bitter dark bars takes some adjusting to, but luckily, there’s a growing number of organic and vegan brands that are on the rise, using almond or soya milk instead of dairy. While these bars are healthier, note that they still pack a caloric punch, so remember: a little of what you fancy does you good, but in moderation, of course! In the name of research, I buckled down and tried over a dozen chocolate brands to give you my honest Organic & Vegan Chocolate Reviews. Now it’s up to you to decide which ones are the most worthy additions to your new favourite health kick. Loving Earth chocolate was made with both health and the planet in mind: these vegan chocolate bars are not only organic, but GMO free, gluten, soy and dairy free and are even sustainably farmed. But their wonderfulness doesn’t stop their. The packaging on these bars are also fully compostable making them great for the environment, too! But did these pass the taste test? Holy cow, yes! This chocolate is simply divine. If since going vegan you’ve been struggling to enjoy the bitter taste of dark chocolate, this will transform the way you perceive it. 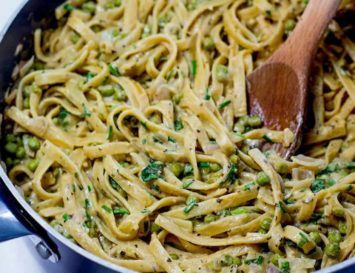 Not only is this stuff richly creamy thanks to the added ‘mylk’, there are loads of flavours to choose from. Whether you like the citrus taste of lemon, the bite of mint or the insanely addictive taste of salted caramel, there’s a bar for you. 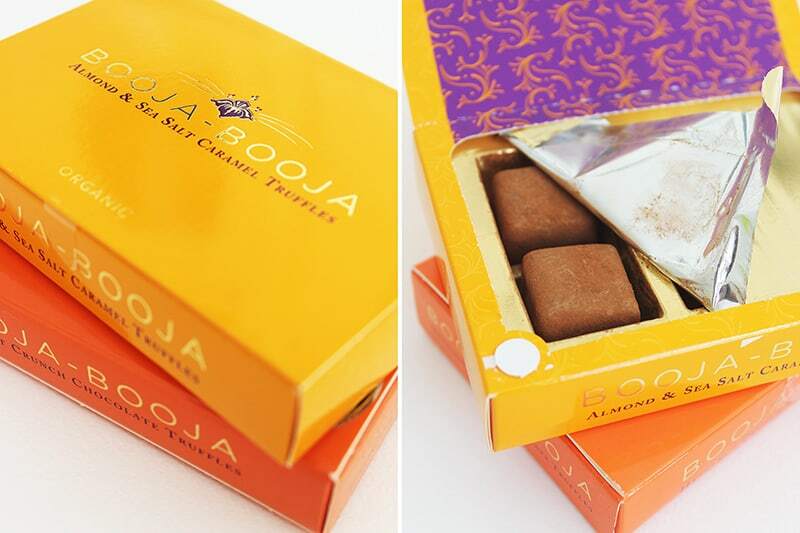 Booja-Booja have crafted excellent vegan chocolates filled with simple, organic, gluten-and-soy free ingredients. Their truffles are decadently rich and melt creamily on the tongue, while the packaging oozes sophistication and class. 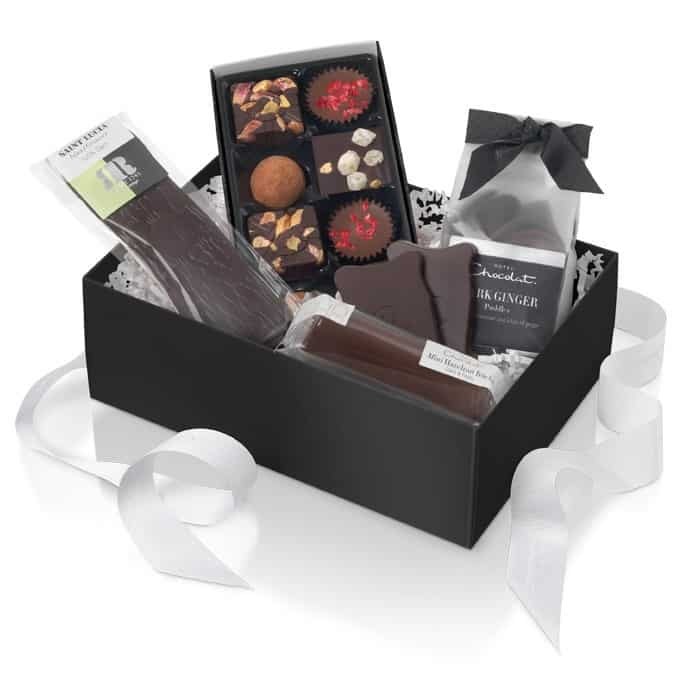 They come in a little gift box with the truffles encased in little compartments, making this the perfect gift to bestow upon a friend or family member. I’ve previously tried the almond & sea salt caramel truffles and they were scrumptious, but lately I’ve been coveted to the truffle selection 2, which has three different flavours in one box. Who wouldn’t enjoy rhubarb and vanilla or almond caramel, especially knowing they’re full of healthy ingredients? It’s a fair assumption to make that this box didn’t last too long in my household. When a selection of vegan, organic, dairy, gluten and soya free Wicked & Wonderful bars dropped through my postbox, alongside two boxes of fairer than fair trade vegan truffles, I was initially delighted by their sleek appearance. Then, as I scoured the ingredients list, my mouth watered at the variations. Toasted coconut dark chocolate? Is this not heaven in a bar? Whilst I myself am not a massive fan of tea flavoured sweets, my dad was a huge fan of the Dark Chocolate & Earl Grey truffles and was only too happy to scoff the lot in one sitting, so tea drinkers worldwide can unite at the ability to have their favourite beverage in a healthy chocolate bar, too. The toasted coconut bar was divine, and had a real tropical vibe from the coconut, but another favourite was the Sour Cherry Dark chocolate. Who knew cherries tasted even better encased in chocolate? Shop Wicked & Wonderful here. Now, I’m more than happy to try any chocolate with the words iQ in the title but one that is also organic, vegan, raw, gluten, dairy and soya free? Sign me up! This chocolate really is handmade from Bean-To-Bar and the girls behind iQ scoured the remotest places on the planet just to find the healthiest, tastiest raw ingredients. I’d heard of iQ chocolate before and had often seen it floating around social media. I did a little research beforehand and found that iQ chocolate was made with the idea of creating a guilt free chocolate bar that still tasted like heaven. So iQ chocolate is great to look at, it’s made from natural, organic flavours that hold raw superfood nutrients and it’s less than 199 calories a bar. But did it taste good? Of course it tasted good! Chocolate Plush Peppermint was a real winner for me. The pepperminty chocolate was stunning with a mug or two of green tea. Thanks to social media, I’d been dying to try Pana chocolate. For months I’d seen these organic, vegan, dairy, gluten and soya free bars splashed across Instagram and YouTube, and so I had super high expectations. And was it worth the wait? Hell yes it was worth the wait! These bars are so rich, I only ate a few squares of each. But that’s not a bad thing, it means it will last us all longer, right? My personal favourite was the sour cherry and vanilla flavour, but these come in so many different variations from fig and wild orange to coconut and goji, it’s pretty hard to pick just one to love. Even more of a reason to a buy a mixed box of Pana and try them all, all I right? First and foremost I love the name of this brand. When looking for raw chocolate, why wouldn’t you go for one that’s named Rawr Chocolate? Especially when they’re vegan, organic, fair trade, dairy, gluten and wheat free as well. Fans of Rawr all have one thing in common; they absolutely love chocolate but they also care about their health, so failing to find a chocolate on the market, the natural next step was to create that chocolate themselves. Here Rawr was born. This isn’t just chocolate without the guilt. it’s chocolate with goodness. So we know they’re good for us, but how did they taste? Heavenly! My favourite bar by far was the Lucuma Cacao bar. It was like the creamiest bar of caramel and most definitely filled the void of ‘white chocolate’ that I used to eat before going plant based. Lucuma may not be a food you’ve heard of, but this superfood powder meant that after this bar, I wasn’t left sluggish and slouched in a chocolate coma; it gave me a real burst of energy making it a fabulous afternoon treat as a pick me up or a pre-gym snack. If you’re looking for a rich chocolate, the dark chocolate bar is a real winner. But if you want to pack in some more superfood goodness, try the goji and vanilla bar. And just a little FYI, these bars may look the part but they’re also fully recyclable. So not only are Rawr bars vegan, healthy and good for us . . . they also help the environment out at the same time. And who said miracles never happened? How quaint and adorable is the packaging on these bars? When a selection of Rococo’s bars came through the door that were all organic, vegan and both gluten and dairy free, I was so thrilled. And it’s not surprising that the first thing I picked up on was the stunning artwork on these chocolates as that was the basis of Rococo. Back in 1983 , Rococo started when a young woman dared to chase her dream: sharing her love of real chocolate with the world. Following on from a Saturday job at the prestigious Harrods upon where she sold chocolate, Chantal’s passion began to grow and she realised her dream was to create her own magical chocolate emporium dedicated to luxury chocolates. It was in 1983 that she managed to set up the first Rococo Chocolates shop on the Kings Road in Chelsea. It’s even been rumoured that Chantal herself was the inspiration behind Joanne Harris’ book, Chocolat (and if you’ve not read the book, it’s also a film with the hunky Johnny Depp – say no more). Whilst the packaging on Rococo is faultless, it wasn’t just this that got massive brownie points from me; the chocolate itself deserves a medal. What I really loved about Rococo is the unusual flavours they offer. From basic dark and Persian lime, crystallised ginger to violet dark chocolate, these definitely cover the luxury spectrum of the chocolate market. 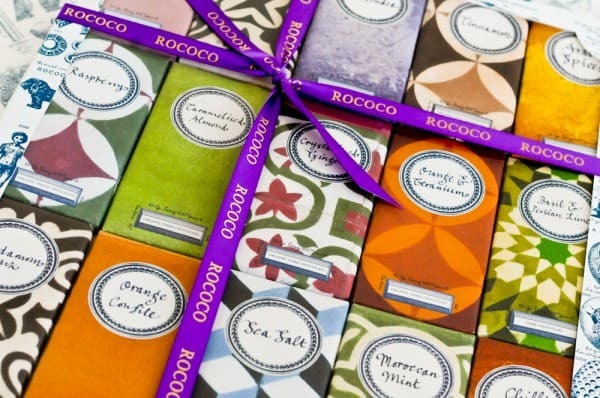 If you’re looking to really woo someone this Valentine’s Day, Rococo does a gorgeous boxed selection containing fifteen different bars. Not all bars are vegan, but there is a section from which I sampled. Don’t all vegans dream of a whole shop dedicated to vegan treats? 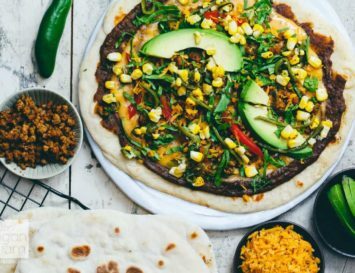 Well it exists, guys, and it’s called Vegan Town! 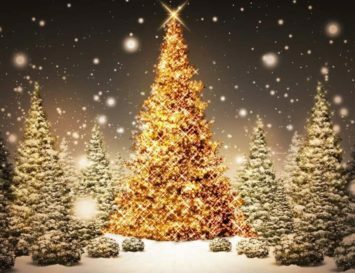 Since 2014, Vegan Town has sourced over 200 vegan friendly products, which is an incredible feat for vegans who now have a go-to place when they fancy a little something naughty. 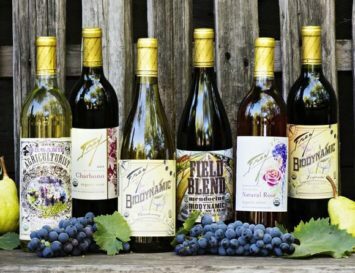 You’ll feel like you won a golden ticket to the Wonka factory with such a wide variety. 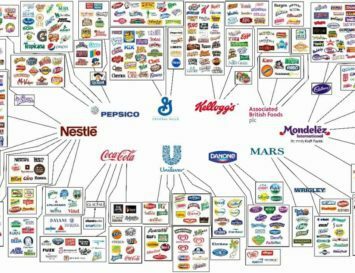 If you miss your non-vegan faves, there’s a choccie bar to match more famous brands. Love the peanut butter taste of Reese’s peanut cups? Try a Cleo’s bar, seriously, it’s exactly the same. My childhood favourite was the Bounty Bar, so when I sampled a Mahalo bar, I felt a little bit like I was floating on a fluffy cloud in coco heaven. The Jokers bar also bears an uncanny resemblance to the famous Snickers chocolates, but isn’t as painfully sweet. If I dare say, I thought it tasted even better than the real deal – it even had my non-vegan, chocolate loving mother hailing vegan chocolate! I’ve known of Hotel Chocolat for some time – there’s a massive shop in my local shopping centre, so it’s pretty hard to not know of it. But it’s always refreshing when you discover that established brands are also creating vegan ranges. Hotel Chocolat creates the most gorgeous chocolate treats, and they now have a range that even vegan chocoholics can enjoy. Seriously, Chilli Penguin Chocolates? How could you resist? 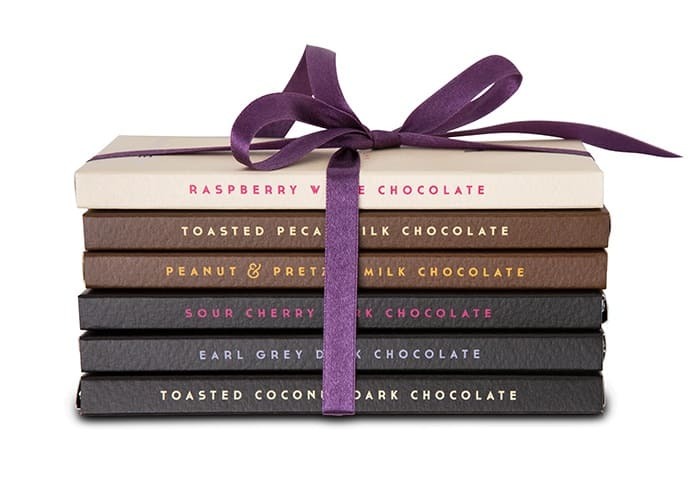 They’re all packaged so beautifully, these chocolates make a great gift, too. Hotel Chocolat were massively generous when sending me samples, and I had a tonne of vegan goodness to get through (tough job, I know…), but one bar that really stood out for me was the Hazelnut & Ginger selector bar. It had the most brilliant crunch to it from the hazelnuts and then this spiciness from the addition of the ginger. Ginger isn’t an ingredient I’d really thought about adding to chocolate, but now it’s a new favourite. Another was their Gianduja Chocolate Bomb Selector, delicious truffle balls that were so smooth, I can only describe them as being like eating silk. Silk that tasted really rich and creamy, with nutty hazelnut praline, of course. 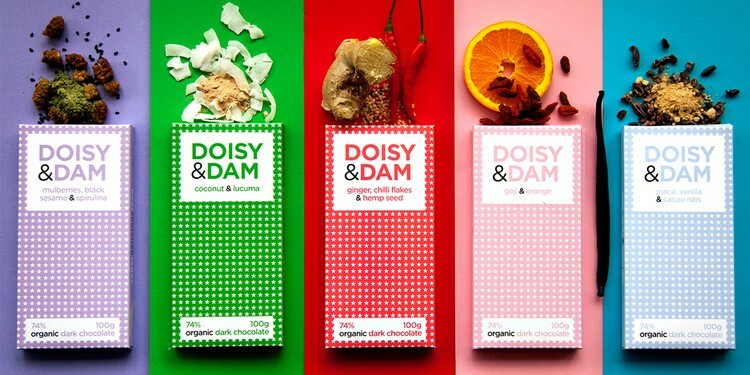 If you’re looking to pack some serious superfood into your chocolate in a two-birds-one-stone manor, Doisy & Dam bars are for you. Doisy & Dam have created a selection of organic and vegan bars bursting with superfood goodness, including lucuma, maca with its super rich vitamins B and C, spirulina which has long been praised for its anti-inflammatory properties, and there’s even a bar with a wonderful dose of fatty acids omega-3 and omega-6 in the form of hemp seeds. So, you could say these bars are nutritional chocolate at its best, making Doisy & Dam a perfect pre-workout snack. I fell in love with the maca, vanilla & cacao nib bar with its delicately sweet edge and lovely texture. A close runner up was the mulberries, black sesame and spirulina bar. I’m not a huge fan of spirulina, but the deliciousness of this bar ensures I’m getting a dose of it whenever I can! Shop Doisy & Dam here. 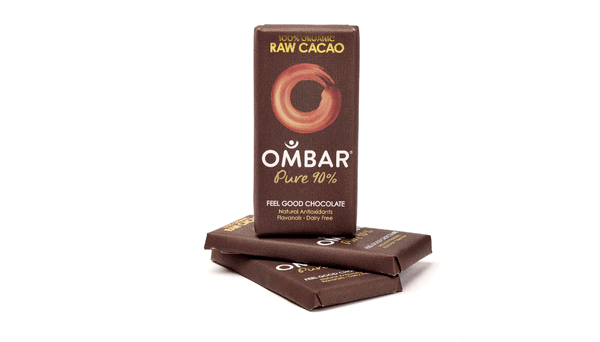 Ombar produces raw chocolate that’s organic, vegan, gluten and dairy free, and is a true testament to good things coming in small packages. Whilst Ombar bars may be small, don’t underestimate just how much flavour and richness has been crammed into one of these treats! The strawberry mylk bar was like devouring the most delicious creamy strawberry shake you’ve ever had, while I also the tangy green tea & lemon bar in minutes. Knowing I was getting an antioxidant boost from eating this just made it even more delicious! Ombar also now do chocolate buttons, which is the perfect treat if you have children who like a little chocolate treat every now and then. 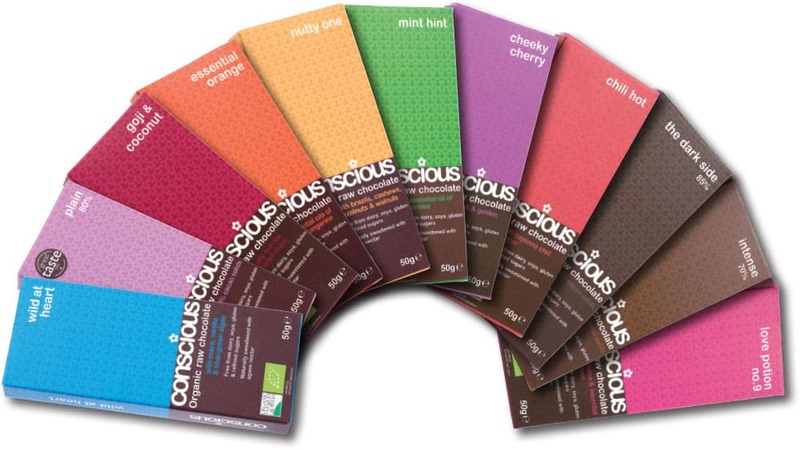 Conscious chocolate is another fabulous vegan brand that create organic, gluten, dairy and soya free chocolate goodness. Conscious Chocolate boasts a whole range of versatile flavours, meaning there is one to suit every one of us. I’ve actually sampled conscious chocolate before now, and it’s a brand that I will always buy if I stumble across it. In fact, Goji & Coconut is a staple in my cupboard, but as always, I’m open to new flavours, and was delighted to try Coconut Crunch, Cranberry Kiss and Chili Hot. Let’s get the hot one out of the way first. I am not a fan of too much spice. I have this inability to handle too much of it without reaching for the nearest glass of water, but this wasn’t actually too much of an attack on my taste buds. I genuinely enjoyed it, although I was only brave enough to sample one measly square – but the rest awaits! Coconut Crunch was heavenly, and I was genuinely surprised by how much I enjoyed Cranberry Kiss. Cranberries aren’t something I eat a lot of. I find them way too bitter for my liking, but in this bar they were the perfect pop of tang to the sweetness of the chocolate. Raw Halo founder and chocolate creator, Meg, made it her mission to create a delicious ‘mylk’ chocolate that not only bursts with goodness, but will also keep us on track when eating a clean, plant based lifestyle. Unlike other brands that just use soya or almond milk, Meg’s mylk is concocted of organic Peruvian cacao, organic cashew nuts, coconut sugar, lucuma powder and a dash of pure vanilla – a unique and tasty creation for sure! 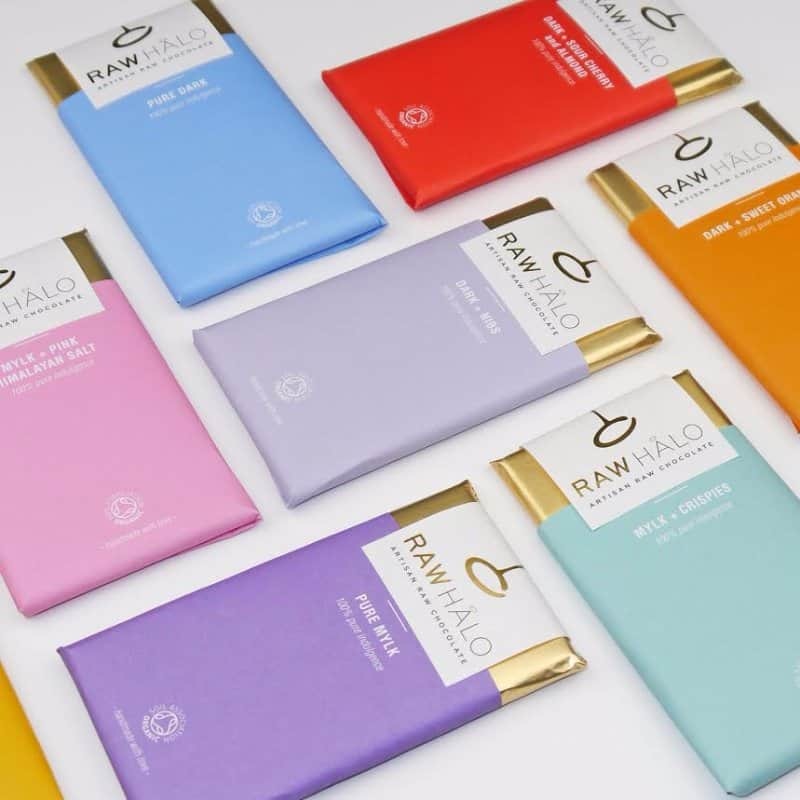 With its simple yet stunning packaging, Raw Halo has a range of flavours to choose from. Whilst Dark + Sour Cherry and Almond was a contender for my favourite bar, I have to admit that Mylk + Crispies won. With the gorgeous flavourings of vanilla and cashew nuts, this crunchy yet smooth bar was such a hit with my taste buds. These bars can be bought in packs of three (because who really wants one single bar of chocolate this good?) or in a pack of six, making these a great choice for stocking up on your favourite flavour, or perhaps buying them to share amongst friends and family. Montezuma’s has the cutest background story. Meet Helen and Simon, a couple who fell in love. Both former lawyers, they left their jobs and took off to travel South America. Camping on a cocoa plantation meant they got to taste lots of delicious chocolates, and then they both had the same brainwave and Montezuma’s was born. In a little Brighton based shop, the couple hand crafted every single bar of chocolate they sold, making sure their cocoa was ethically sourced from plantations that meet strict Fair Trade policies. I was delighted to trial a selection of their range that is organic, vegan, gluten, egg, wheat, soya and dairy free. Their packaging is wonderfully eye-catching, and with such a versatile range of flavours, I couldn’t wait to get stuck in. The first bar I tasted was Sea Dog. I know, strange name, but don’t think of the aroma of wet dog – think zesty lime and salty sea! So rich and creamy and with a real bite of lime, I was hooked. I cannot confirm nor deny that I ate the whole bar in one sitting. Another winner from Montezuma’s was their drinking chocolate. You literally plop these chocolate tablets into your favourite warm milk (almond was the best) and wait for the chocolate to melt, and create a stunning hot chocolate. Hot chocolate not really your thing? Well, perhaps chilli hot chocolate may change your mind. It did for me! The Raw Chocolate Company’s founder Linus is all about raw foods, so it was natural he’d create a tasty range of raw chocolate bars. Lucky for us! These happy looking bars are all vegan, organic, gluten free, fair trade and kosher. Seriously, don’t these bars just make you instantly happy looking at them? Never underestimate the power of packaging. But what you really want to know is, what do these bad boys taste like? Honestly? I think you need to sample them for yourself to really understand how insanely good these are. The Raw Chocolate Co’s vanoffee chocolate is another staple in my cupboard. It’s the reason why I loved Loving Earth so much; it’s so creamy, it really doesn’t feel as thought I’m eating raw cacao. The Vanoffe bar is a real treat to the palette; it’s like eating the creamiest vanilla based chocolate. But if you like your chocolate with a little dark bite, then opt for the vanoffe dark bar. Another bar I enjoyed was the Orange Raw Chocolate bar. Remember that chocolate orange you probably all enjoyed as a kid? This is a healthier, vegan version of that chocolate and it’s so good! Shop The Raw Chocolate Co here. At Moo Free, Cows are King. 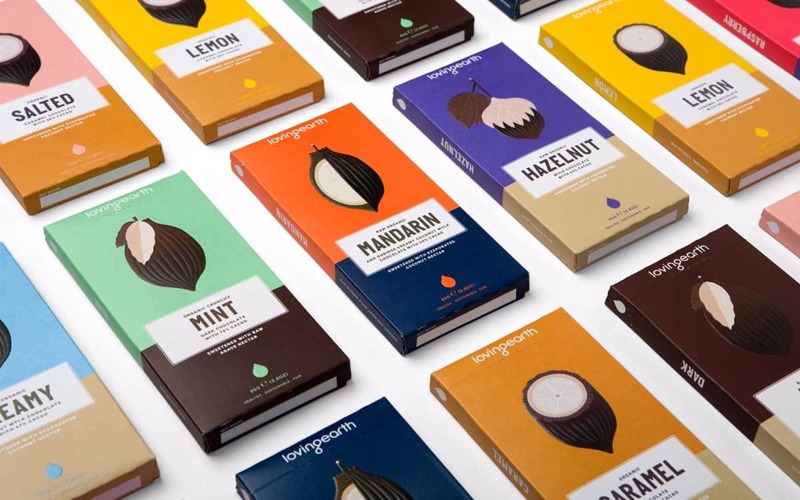 The brand stands for the importance of sourcing chocolate that’s good for us and the planet, as well as keeping it mind the fact that cows aren’t ours to use and abuse to create products – yep, you guessed it: this is a vegan brand. These bars are also super cute, too! 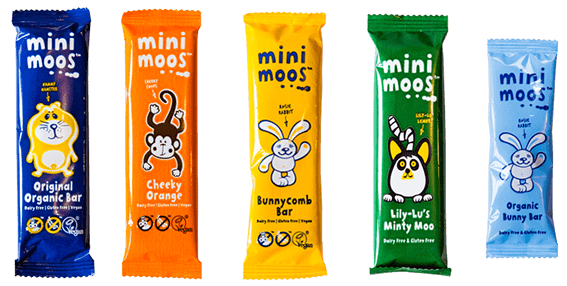 And the reason I wanted to share Moo Free bars with you all is because whilst I enjoyed them, they also do a Mini Moos range, which is perfect for children. While parents are becoming a little more health conscious these days, you can’t fault children for still wanting a little chocolate treat, and Mini Moos are the perfect substitute for those sugar laden bars your children are most probably used to eating. These taste great, come in an array of flavours (Bunnycomb honeycomb being my fave) and contain absolutely no nasty stuff. 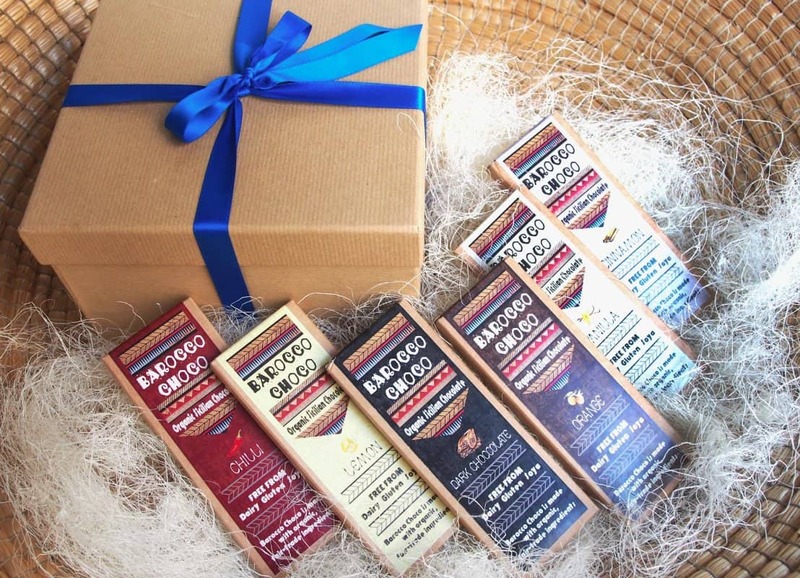 It’s vegan, organic and Fair-Trade, but Italian brand Barocco Choco has even more amazing qualities than those: this is an artisan dark chocolate range which is made according to an ancient Aztec recipe that was brought to the Sicilian Baroque town of Modica many centuries ago. Unlike modern chocolate-making methods, Barocco Choco is cold-worked, which helps to preserve a high level of nutrients, minerals and anti- oxidants, whilst maximising the rich, delicious flavour. The unique production method, which follows the Aztec tradition, creates a product quite unlike conventional chocolate – a product that’s rich and earthy, wonderfully grainy and undeniably delicious! This handmade brand has six simple exciting flavours to explore: vanilla, lemon, chilli, cinnamon, orange, pure dark chocolate. They just picked up 2 nominations in the free from food awards 2016.
unlike the other teams above, they use heirloom, single estate cacao that is directly traded with farmers. The U.K.s most ethical and highest quality Chocolatemaker… Check them out!